This review is by Dave Maddox of SF Site. See the original review here or read it below. The future. Humanity has been divided into three factions, the Disembodied, the Departed, and the Dispossessed. The story follows these three very different versions of the human race as they continue the to grow, to evolve, and to survive in a world that has been drastically separated. 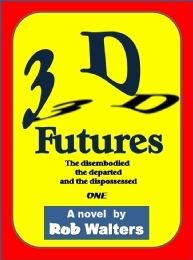 Rob Walters is basically telling four stories with his novel 3D Futures. The first is the history of the world, and how humanity changed into three such varied versions of it. Then there's the tale of the Disembodied, or Dispos, who were the rich or privileged. They made themselves immortal long ago by copying their brains into massive computer servers hidden deep within Earth. We're told the story of the Departed, or Depars, who left Earth long ago on a self-contained spaceship to colonize a new world. And finally, there's the struggle for survival of the Dispossessed, the Dispos, what's left of humanity after the retreat of the wealthy, the mass exodus of the rest and the collapse of society on the Earth itself. Each story has its own storyteller; the clever Zimbaud in the world of the Disems, tackles a mental mystery to discover if there's a killer among the sentient program. Young Talli of the Depars struggles to understand life on the spaceship and faces revolution. And bold Remus of the Dispos fights the savage Morgants to keep his clan alive for another day among the crumbling ruins of the planet. The stories themselves are a tad simple but enjoyable nonetheless. The tales are almost completely unconnected, until the end when some clever twists bring enough together to fully create the cohesive world the writer has envisioned. What really makes this book unique is that Walters truly utilizes the eBook format to a degree many haven't attempted yet. Each section is begun with a seldom used character font that to allow for searching instantly on your eReader. So if you're enjoying the Dispos' story and don't want it intercut with the next chapter of the Depars, you can click over to the next segment, then click back to read what you missed. All the stories can be read individually, or mixed, with ease depending on what strikes the reader's fancy. Overall, 3D Futures is a satisfying book. The characters are believable enough as products of the worlds that created them and the stories are engaging and fun. And, although the basic stories are resolved, there's just enough questions left to make for an interesting continuation in what's sure to be next.